It's just over a week until we Share. Are you ready? We have a record number of teachers and community groups sharing their skills and projects with you this time. And, of course, people will be bringing many interesting things to share as well. It's going to be lots of fun. In order to get you ready, we thought that we'd share a recent blog post with you. A couple of months ago, a writer for Shareable magazine approached us to contribute to their article on Share Fests. You can read about that and our response to the writer here. Enjoy! If you would like to volunteer - to help set-up, manage, greet or clean-up - there is room for a few more people. You can sign up for a spot here. Bart Anderson - Learning to have good conversations has been a revelation to many of us in Transition. Come join us as we get to know each other, share our discoveries and worries and just have a good time. Kathy Bibby - If you haven't experienced essential oils as a natural way to relax and take the edge off being stressed, dragging or sleep-deprived, I'll be sharing a unique and wonderful hand rub with Certified Pure Therapeutic Grade essential oils." Kath yis a Certified Aroma Touch Technique practitioner. Amanda Kovattana will once again share her shoemaking skills. This time with an emphasis on making and designing sandals. Herb Moore will show us some examples of simple instruments you can make from household objects. William Mutch will teach us knife sharpening. Peggy Prendergast will teach core strength training. Emily Rosen CMT, will facilitate massage, working with people in pairs. Sooooothe and connect.. Partner up with a friend and learn some great techniques for 10 minute seated massage. We could all use some TLC! Diane Ruddle - Come see the power and versatility of solar cooking. We will demonstrate several types including: a SolSource parabolic cooker, a Global Sun Oven and a solar hotdog cooker made from a Pringles can. Instructor chef Joni Sare will teach culinary life skills. You will learn how to properly hold and use a knife, as well as specific techniques. You'll be using a knife like a pro in as little as 5 minutes. Joni will also share efficiency tips, how to select/store produce, and more. Friends of the Palo Alto Library (FOPAL) will have a book table. Neighbors Helping Neighbors (NHN) will be providing some give-a-ways and sharing information about their programs that benefit the community. NHN has a Backyard Bounty Program for Gardeners-Beekeepers-Coopsters. Come see their backyard garden program display, receive seeds and more. NHN will have an actual Bee Colony and Beekeeper on hand for Q&A. 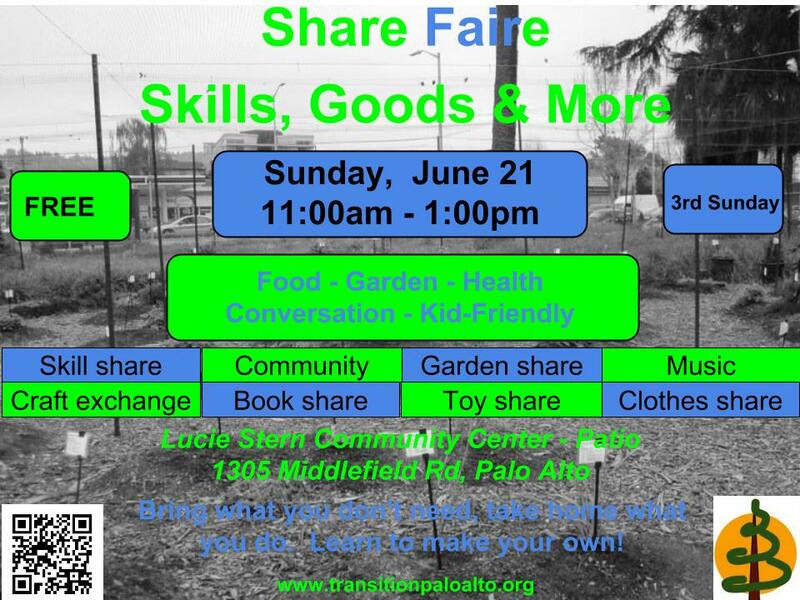 Zero Waste Palo Alto will share information about the new residential food scraps composting collection program starting July 1. Make sure to follow us via your favorite social media. We send e-mail, post on Facebook, have a Transition Palo Alto web-site, a Meetup group, a Twitter feed and more. And tell others to join us - feel free to post the attached flyer to your favorite hangout.